A day-long public conference that includes many academic luminaries will be entirely dedicated to the work of Benjamin Binstock, Adjunct Assistant Professor of the faculty of Humanities and Social Sciences, where he teaches art history. Entitled "Vermeer's Daughter?" the conference, organized by The New York Institute for the Humanities [NYIH] at New York University, on Saturday, May 18, is based on the work and questions raised by Professor Binstock's 2009 book, Vermeer's Family Secrets: Genius, Discovery, and the Unknown Apprentice (Routledge). On hand to discuss the work will be major thinkers, like intellectual historian Anthony Grafton, art historians Linda Nochlin and James Elkins, as well as the artist Chuck Close, among others. "This is the first time a member of the HSS faculty has had an entire conference dedicated to his work during my time here," William Germano, Dean of the faculty of HSS since 2006, said. 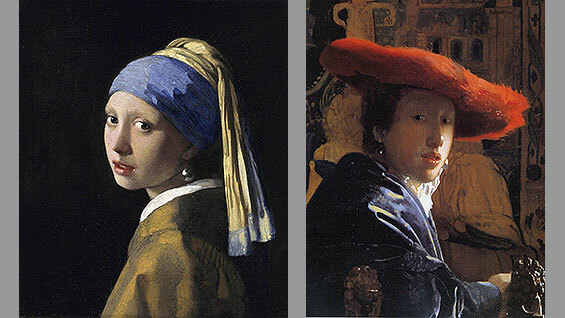 Professor Binstock’s book proposes a controversial theory that several paintings attributed to the Dutch Old Master Johannes Vermeer (1632 - 1675), perhaps best known for "Girl with a Pearl Earing," are actually painted by his eldest daughter, Maria. Prof. Binstock suggests in his book that Maria, who may have modeled for the iconic "Girl With A Pearl Earning," apprenticed to her father, producing several paintings that are widely attributed to him, including "The Girl with the Red Hat." This theory has met a frosty reception among many cognoscenti that the conference seeks to explore further. “The art historians you think of when you think of Vermeer won’t talk about this book,” says Lawrence Weschler, Director of the NYIH. Weschler says he organized the conference after being both impressed with Vermeer’s Family Secrets and surprised by what he describes as the “thunderous silence” of its reception by the art historical community. “Part of this motive for repressing certain issues might be money,” Binstock says and Weschler agrees, describing what he sees as a “comedy of vested interests.” Many art historians and museum administrators have relationships with institutions or individuals who own works by the Dutch master, he explains. Those works could potentially lose significant monetary value if their authenticity or authorship were to be put into question. The owner of such a work could likewise lose status or prestige. In the core argument of the book, Binstock arranges scale representations of each painting laid out in chronological order—a method he extends to his teaching at Cooper by hanging scale reproductions of paintings in the classroom—through which he identifies certain “misfit” works. “The paintings currently assigned to Vermeer cannot be arranged in a coherent chronology,” Binstock writes. “One can only do so after removing the misfit paintings, which likewise reveal their own consistent development, in a dialogue with Vermeer, increasingly borrowing and combining elements of his compositions, employing the same models, costumes, objects, and interiors, and influencing him in turn.” He describes Maria Vermeer not as a lesser imitator of her father, but as a genius in her own right.